The Eco-Friendly Spiral Jotter & Pen can be used to promote your brand as one that cares for humankind. It has a 65 page lined jotter, an elastic band closure, an elastic pen loop, and a pen. 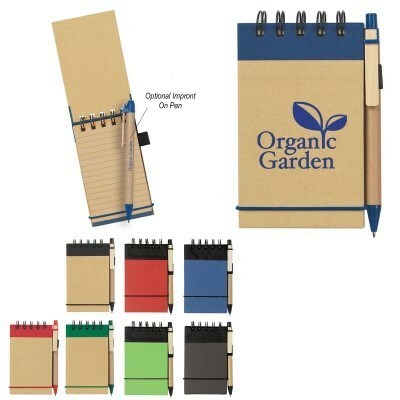 The Eco-Friendly Spiral Jotter & Pen can be used to promote your brand as one that cares for humankind. It has a 65 page lined jotter, an elastic band closure, an elastic pen loop, and a pen. The pen has a paper barrel and a wooden clip that are recyclable. Imprint your company’s logo on this useful product, to boost brand recognition. Give away this notebook and pen combo at colleges and offices and make it a walking billboard for your brand.